Mary married Mike T. Zatylny, who farms in the R.M. of Harrison. They have three children, Edward, Sylvia ­ Mrs. Don Kostiw, and Wayne. Florence married Sam Shewchuk, farmed in the R.M. of Harrison and have recently retired to Brandon, Manitoba. They have a daughter Laurie who is a school teacher. Christine married Peter Zwarich. (refer to Zwarich, Peter and Christine). Victor purchased E. 1/2 23-17-18W. He is a charter member of The Knights of Columbus. Elmer purchased N.E. 14-17-18W, S.W. 24-17-18W. He farms with his brother Victor. Bill, resides in East View Lodge, Neepawa. Mike (refer to Boyko, Mike and Margaret). Michael Boyko, one of five children born to George and Annie (Bobyk) Boyko. Michael was born at home on the farm homestead, namely S.E. 24-17-17W in the Hilltop District on August 28, 1904. He attended school at Lund School whenever possible. He would spend a great deal of school days at home helping with the farm work and in the bush cutting logs. As Michael grew older, he became interested in a certain young lady from the Scandinavia district. With the rain showering good wishes upon them, on May 27, 1933, Michael married the former Martha (Margaret) Kopeechuk. They were married in St. Mary's Ukrainian Catholic Church in Mountain Road. Their reception was held at the home of the bride's parents. Their first home was a small plastered house on S.W. 14-17-17W where they lived for three years and had two children, both born at home. From here they moved to the Boyko homestead on S.E. 24-17-17W. There five more children were born, again all at home. They lived on this homestead for approximately five years. Mike would be away from home a great deal as he spent most of his time in the bush cutting logs and selling wood for a living. Meanwhile, Margaret would be at home tending her children and looking after the farm. Mike also worked at Baraniuk's sawmill. In 1940 they decided to leave the Mountain Road district and moved one mile west of Erickson. There they rented the John Carlson farm. In the fall of 1948, they purchased the Edgar Miller place on N.E. 29-17-18 one mile south of Erickson. It was here where the eighth child was born. Mike was employed with the dray business in Erickson for about eight years. He then worked for Manitoba Telephone System for ap­ proximately two years, and then as a plumber's helper in Winnipeg for three summers. After that he joined the Manitoba Hydro and worked with them until his retirement at age 65. His remaining years were spent at home with Margaret until his death on June 20, 1975, at the age of 71. Margaret still resides at this place and keeps quite active. 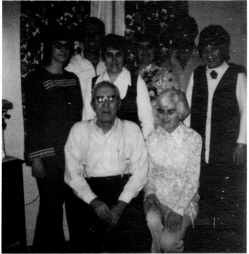 Back Row, Left to Right: Sherian, Rudolph, Eleanor, Ruth, Donald, Inez. Front Row: Mike and Margaret Boyko. Ruth Grace: On March 25, 1934, the first child was born to Mike and Margaret. Ruth attended schools in Erickson. She worked as a waitress for Wally's Cafe and as a store clerk at Ivar Gunnarson's. In 1951, she married Stan Usick and now resides in St. Catharines, Ontario. They have one child, Valerie Mae, still at home. Inez Jane: Born on March 28, 1935. Inez attended school in Erickson. She worked as a housekeeper for Frank Averill's and for Adolf Sillen's. She also worked as a waitress at Ivar's. In 1952, she married Paul Shewchuk. Now she has remarried and resides in Maple Ridge, B.C. She has two children, Dwayne (married, with one son) and Vernon, both residing in Maple Ridge. Gloria: Born March 15, 1936, died December 11, 1936. Donald Michael: Born on April 10, 1937. He attended school in Erickson, and helped Dad with dray business and then joined Manitoba Hydro. In 1957, he married Mildred Herbert of Red Deer, Alberta, and went into carpentry business, building houses and now resides in Vernon, B.C. They have three children, Robert, married in Vancouver, B.C. Scott and Kelly in Grande Prairie, Alberta. Eleanor: Born on October 3, 1938. She attended school in Erickson, She worked as waitress at Ivar's and in Brandon. In 1959, she married Robert Vandewater. They lived on different Air Force Bases and now reside in Trenton, Ontario. They have two children, Jackie, married, with one son, and lives in Germany and Grant is at home.